This thrilling 2019 1/4 oz Gold Lunar Year of The Pig Coin is the latest release in the landmark Lunar Series II from the prominent Perth Mint featuring the newest “Year of the Pig” image. The Lunar Series I program was released in 1999 by the Perth Mint and it instantly gained tremendous popularity. The Lunar Series II started in 2008 with the “Year of the Mouse” release so the two coin programs overlapped during 2008 and 2010. The Lunar program is highly popular due to its high purity and impressive design, each year depicting the image of the Chinese Zodiac character. The 2019 issue presents the image of a pig and people born under this sign are considered happy, easygoing, honest, and trusting. On the reverse, this coin features a domesticated pig standing on a field with rocks and foliage. Above the pig is a peony, also known as the king of flowers, hovers over him. To the right of the traditional floral symbol of China, the Chinese character for pig is seen. 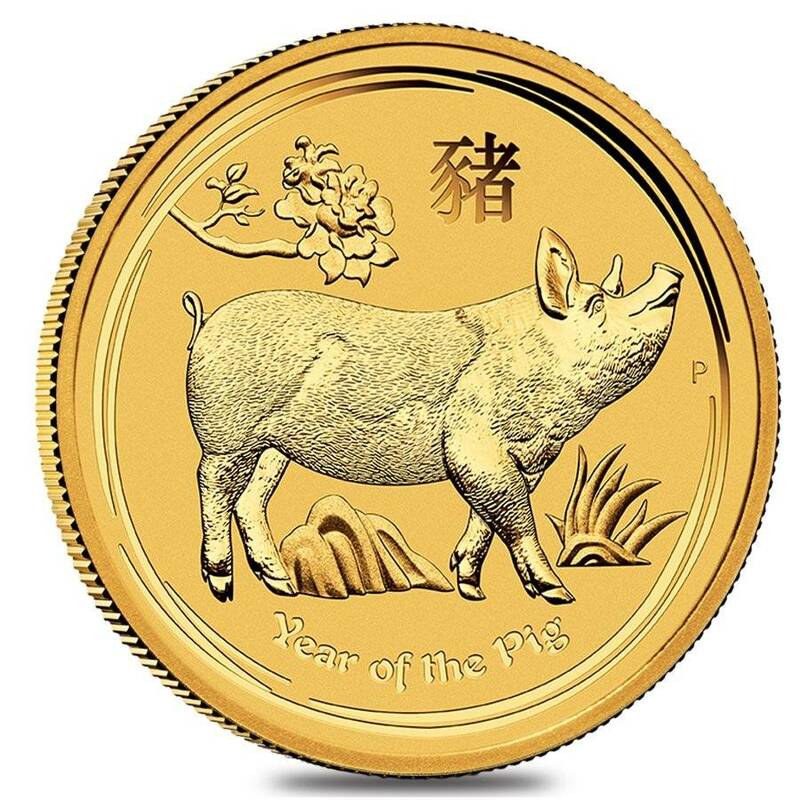 On the bottom of the reverse, the inscription Year of the Pig is written. The obverse features Ian Rank-Broadley effigy of Her Majesty Queen Elizabeth II. The year, denomination, weight, and fineness are all seen encircled around the obverse. 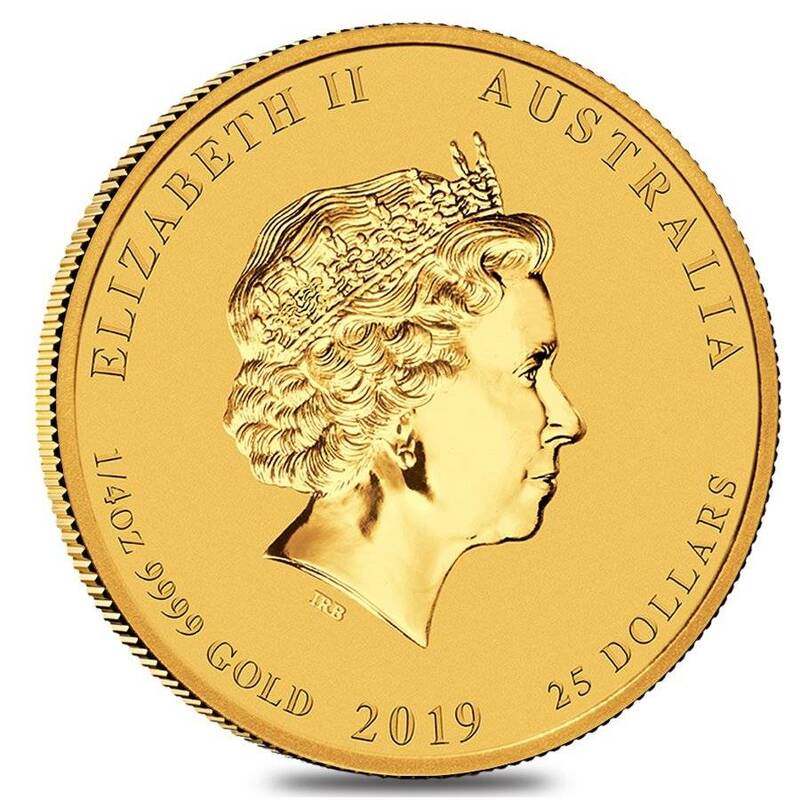 Bullion Exchanges is proud to carry the Gold Mint Perth Lunar Series II Coins along with many other popular coins from the Perth Mint. 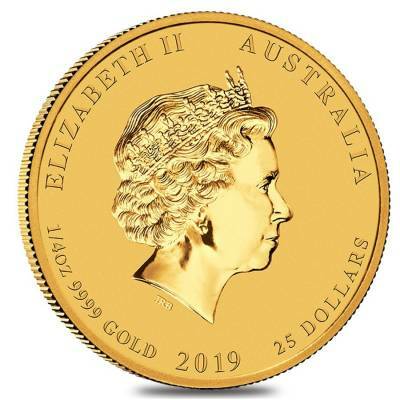 Add this beautiful coin to your collection today, and it will be carefully wrapped, packaged, and delivered to your address. If you have any questions, send us a message through our website or email us at customerservice@bullionexchanges.com and we will be happy to assist you. With this purchase, you earn 353 Bullionaire Bucks 353 BB = $0.35. For every $1 spend, you will earn 1 Bullionaire Buck which is equivalent to $0.001 off a future purchase. 353 BB = $0.35.